Genuine Stingray Skin - Caviar Finish in Gray | Buy Exotic Leather Skins and Hides Online in the U.S. with Roj&eacute; Exotic American Leathers. Stingray is a highly versatile leather and Rojé offers the largest revolving stock of stingray colors, finishes and sizes available. We have proudly served our clients that are producing luxury furniture, upholstery, and handbags and accessories. Caviar finish stingray skins have the least amount of processing from their natural sandpaper texture and appearance; they feature the smooth stippled bumps (or beads) with a signature embellished diamond shape in the center located at the natural calcium deposit or clusters. Shagreen or polished stingray skins have been polished approximately 50% to a flat texture. If the shagreen has a base color then the process starts with drum dying stingray crust then polishing which leaves variations in the color. Our Natural white shagreen skins have not been dyed or colored and will never be a stark white however over the last 15 years of development we have the whitest natural white skin in the marketplace. Hologram finish stingray skins are caviar finish with a metallic film foil overlay. Every stingray skin has two breathing hole slits at the upper section; these holes and the space between them are not considered in the grading of the finished skin. 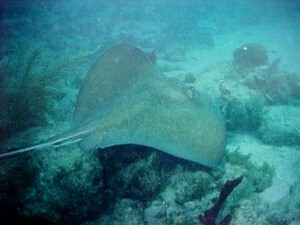 The stingray size is determined by measuring the widest area below these two breathing holes. Stingray sizes are important depending on your project; a 6 inch stingray skin is the correct size for bi fold wallet production with the calcium cluster centered. Our medium size stingray skins are preferred in art deco furniture and woodworking projects and tendto produce the whitest natural whites during polishing with the least amount of cream undertones Our XL skins are the preferred size for upholstery projects as well as handbag and accessory production with a cut size of 12 inches by 12 inches with the calcium cluster centered. The wider the skin, the more rare it is; the largest skins used in production are 14.5-16 inches. These extra large skins amount to only 5% of all wild-caught rays the XL size animal is also the size of ray that ultimately took the famed Crocodile Hunter Steve Irwin's life in 2006 . Rojé stocks sizes from Small to XL. Our goal is to meet market demands and have trending colors on our shelves to ship immediately so you can build your sample(s) then feel confident that orders taken can be fulfilled with uniform colors and finishes. Small 6 - 7 inch width. Medium 7 - 8 inch width. 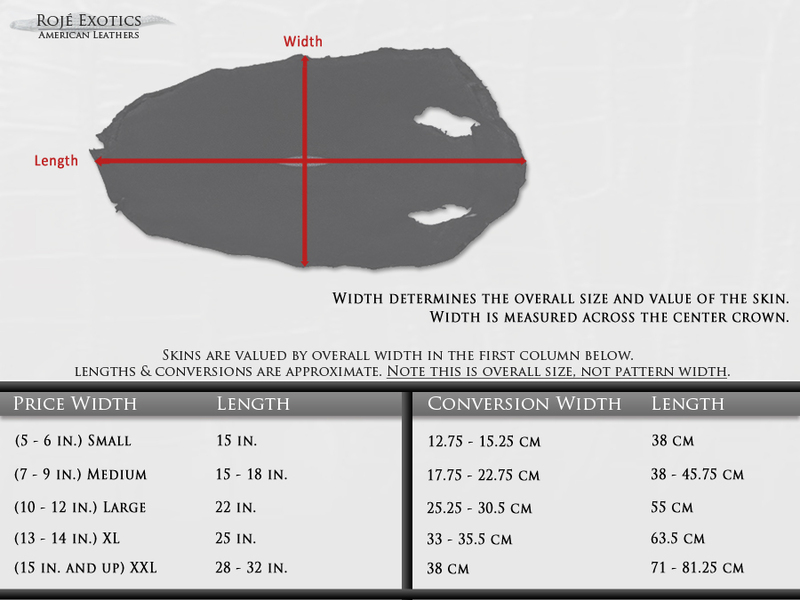 Large 10 - 11 inch width. XL 14.5 - 16 inch width. *Note that all exotic skins are a commodity, and as such, all of our leathers are subject to availability and market prices. With a reasonable production minimum, Rojé can produce new customized prints and colors for clients who are past the sampling phase of their project and ready for production. We currently have 100,000 stingray skins available in crust, ready to apply any PantoneÂ® color or an image you would like printed onto the skins within 30-45 days. http://www.rojeleather.com/production-inquiries-contact-form/ Contact us with your project details to discuss.